Florissant Valley Fire Protection District, in partnership with Florissant Police Department, offers Community Emergency Response Team training several times each year. The Federal Emergency Management Agency (FEMA) began promoting nationwide use of the Community Emergency Response Team (CERT) concept in 1994. Since its inception, CERTs have been established in hundreds of communities. 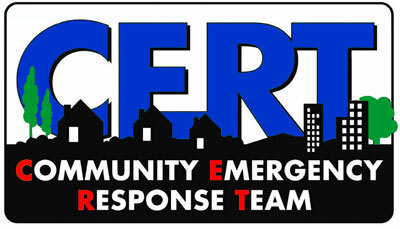 CERT training promotes a partnership between emergency services and the people that they serve. The goal is for emergency personnel to train members of neighborhoods, community organizations, or workplaces in basic response skills. CERT members are then integrated into the emergency capability for their area. If a disaster overwhelms or delays the communityís professional responders, CERT members can assist by applying the skills that they learn during training. These skills can help save and sustain lives following a disaster until professional help arrives. Take steps to prepare for a disaster. Work as a team to apply basic fire suppression strategies, resources and safety measures to extinguish a burning liquid. Apply techniques for opening airways, controlling bleeding and treating shock. Select and set-up a treatment area. The CERT Training consists of 21 hours of classroom instruction, one night a week for six weeks. Emergency personnel from Florissant Valley Fire Protection District and Florissant Police Department will teach the program.